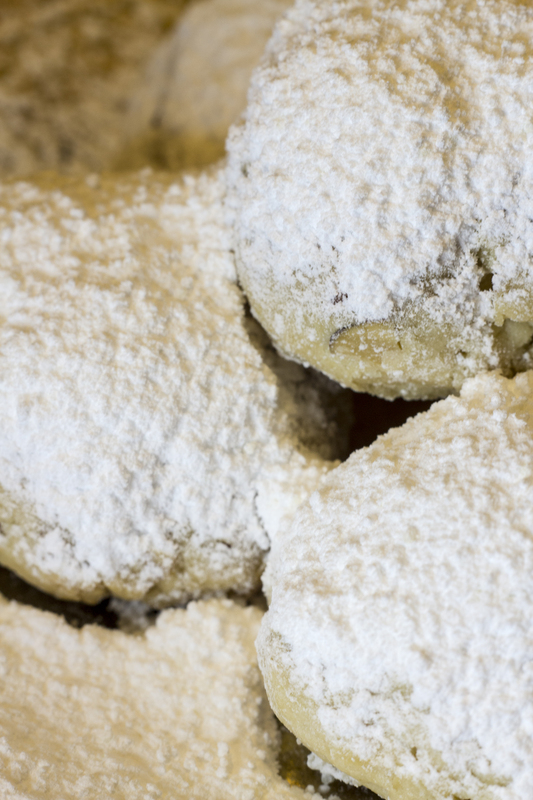 Looking for a great holiday cookie recipe to make? This is the perfect one!! Don’t let the long name full you. These cookies are light and melt in your mouth kind of cookie. 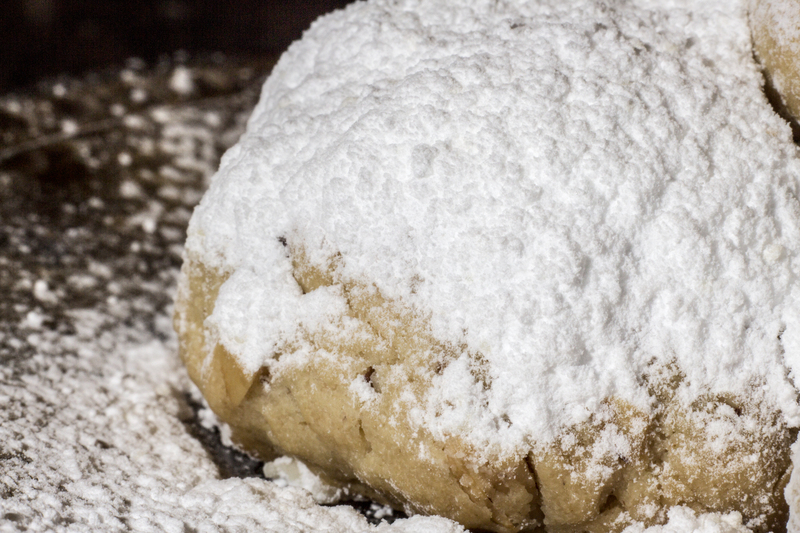 Full of powdery sugar and goodness. Check out the wonderful recipe below. Preheat the oven to 350 F or 180 C. Lightly toast the almonds in the oven. Add almonds to a Cuisinart and pulse the almonds until finely chopped. In a large bowl, using a mixer, beat the butter and 1/2 cup of sugar for 15 minutes until light and creamy. Add egg yolks, sea salt, and baking powder to the mixer. Beat for 1 minute or until combined. Add 1 3/4 cups of sifted flour to the butter mixture and knead. Add in the remaining flour. Knead the dough for about 8 minutes. Break off a piece of dough, the size of a walnut, and shape into a ball or oval. Repeat with remaining dough and place onto an ungreased baking sheet. Bake for about 10 minutes or until the cookies are pale and yellowish golden in color. Remove cookies from cookie sheet and cool on to a wire rack. 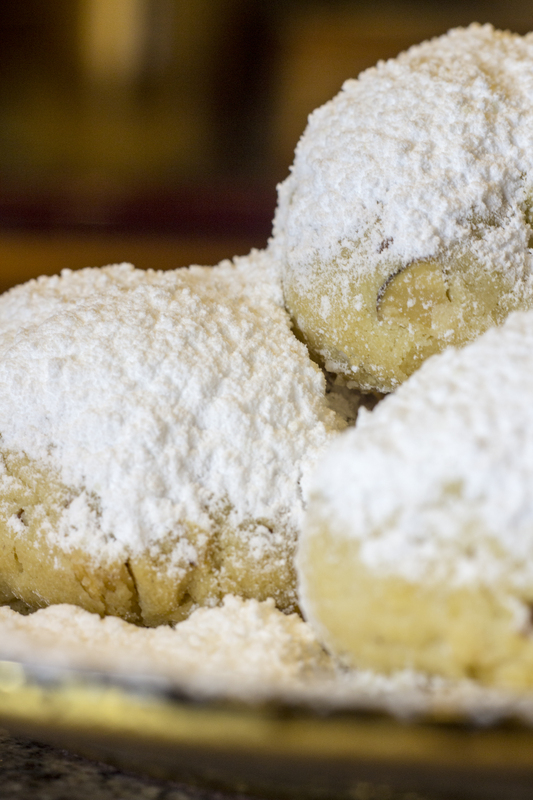 Sift the confectioner’s sugar over the kourambiedes until they are completely doused in sugar. I usually store my cookies in a tin. You can freeze cookies and they last up to a few months. Very nice, Krystina! I love them what ever they are called. They are similar (but not the same) as Russian teacakes – Mexican wedding cakes – Swedish teacakes right? Very nice to hear for you. Yes they are very similar to Russian Tea Cookies. You know your cookies. 😉 The magazine is getting together nicely and can’t wait to show you. I am working on having a online version of it. This sounds very tasty! I would love to try this recipe out! You forgot to tell us where to put the almonds in! My guess is they go in with the flour..
I’m so sorry!! Okay so when you add the remaining flour, then you will fold in the chopped almonds. I hope your recipe turns out delicious!! These look really delicious traditional cookies. I am making these this afternoon. Love the idea of chopped almonds in the cookies which will add a crunchy texture. I have tried many Kourambiethes recipes, and most include finely ground almonds. I remember hearing about your Peppermint Kourambiedes. Please share the recipe! The almonds do add a lovely texture, and always my favorite too. I toast my almonds too. I will try to post that recipe soon. Is your book available in bookstores worldwide? Wow was it the Ellen Karis show? If so that is great you tuned in. Yes I made kourambiedes with peppermint candies in the center, and to this day it is my absolute favorite! My book is available worldwide, and in ebook and print. Thank you for reaching out. Wishing you and your family a prosperous New Year! Btw I loveee your wordpress name!! Yes! it was the Ellen Karis show. I tuned in for info on your new book as I just love Greek cookbooks. I read them like novels. I will be adding yours to my kitchen bookshelf. The recipes must be amazing. That’s great. She’s one of my favorite Greek comedians! Oh I’m so happy to hear that.